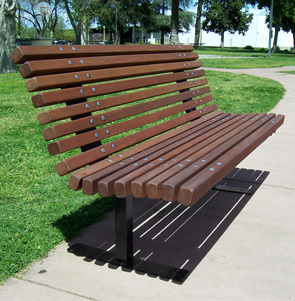 The Palisade wood bench has an inviting appeal with a contoured seat and back available in white oak or redwood. Featuring evenly positioned wood rails double bolted with decorative flat head rivets. The spaced out wood helps the bench dry off quicker after the rain. The edges are rounded of slightly for safety. Offered in lengths up to 8' to accommodate the needs of various settings. 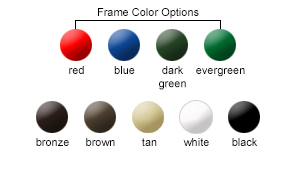 The frame is available in the powder-coated color options shown. Choose portable, in-ground mount or surface mount base.